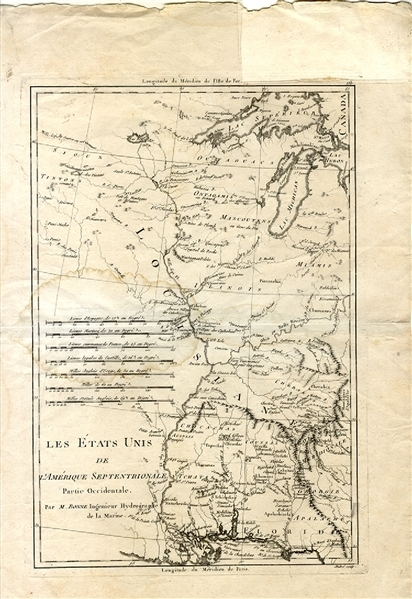 Engraved Map, 12-1/2” x 18”, “Les États Unis de l'Amérique Septentrionale, Partie Occidentale,” 1788, attributed to Peter Andre and Rigobert Bonne, VG. The map centers of the Mississippi river with the area from Canada to the North, Florida SE., including Lake Michigan, Miamis, and showing “Louisiane” cover the interior area. of course, this will become the Louisiana Purchase 15 years later.